Why is history not repeating itself in Macedonia? Macedonians need to do away with an old mentality of politics and pave the way for real change. Editor’s note: On Sunday May 17. a major opposition rally has been called in Skopje to protest against the government of Prime Minister Nikola Gruevski. 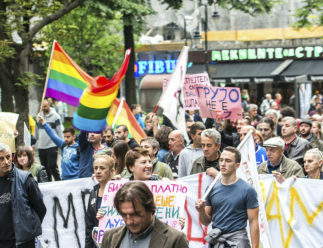 The event marks the latest in a series of protests in Macedonia’s capital since the turn of the year, which have come to a head in recent weeks. Frustrations are many and varied but have been fueled by the opposition’s weekly releases of a series of leaked illegal wiretaps. Dubbed ‘bombs,’ the releases allegedly implicate top officials in crimes ranging from electoral fraud to conspiring to cover up murder. Artan Sadiku is an activist who has been involved in the ongoing protests. It is beyond any doubt that in Macedonia, we have been living an experiment for several years. One that is only possible through a gesture of political ethnic manipulation. In 1991, when Macedonia gained independence, it was termed the ‘Oasis of peace,’ because it emerged intact out of Yugoslavia; not a single bullet was fired at a time of historical Balkan conflict. However, it followed the path of ethnocentric nation building, a process that proved to be the model for all of the ex-Yugoslav republics. Albanians, who composed almost a third of the population, were left out of the picture and excluded through discriminatory legislation. The initial exclusion was redeemed in 2001 after a small armed conflict and a peaceful solution, but the lines of division continued to run across society, the media, schools, streets and bars; the talk of the day remained concealed within two parallel worlds. Politics capitalized on that well enough, by pursuing a division to the extremes and neglecting the crippling socio-economic status of the majority. The country became poorer and poorer under the rule of nationalism, one that had two heads; Macedonian and Albanian. Activists are ordinary people, they refuse to become normalized, formalized and framed by the language and practice of party politics. Through tough years of misbelief and lack of support, a social movement was slowly being brewed, although initially with limited support from the people. In 2011, NGO revelations of a young man’s murder by a member of the police, led to a serious revolt, that many rushed to term a ‘delayed May 68.’ It was a mistake; just as with the real May 68, formal politics remained unchanged, and became no more responsible towards the lives of the people. But something remained in the realm of the people, a change had come about, but it was asleep. We kept on with the same manner until another movement came along; the AMAN! Initiative. It resisted the increase of electricity prices, it addressed the real everyday needs of the people and it failed in its goal. The political parties, emerged again as the main determinants of the whole of society’s present and future. We are now in 2015, the calmest year in terms of the inter-ethnic incidents, which – especially during the preceding two years – had become part of everyday life. A government comprising of a Macedonian and an Albanian party have ruled the country for almost a decade, lacking in any coherent political vision. They have turned Macedonia into a country with absolutely no vision for the future and have ruined many things along the way; freedom of the media has been restricted, workers’ rights and living standards have been seriously degraded, the autonomy of the university and students’ future have been threatened, and it has very much kept alive the tendency of ethnocentrism in policy making. In short, Macedonia has become the nightmare of any political analysis that attempts to employ classical political concepts. Something dangerous has been in the making. Gruevski has come to symbolize a new breed of populist, nationalist, conservative and authoritarian politician. Several groups of activists, workers, journalists, teachers, students and youth started to organize around their interests. A series of protests and demonstrations raged for several months. Since January, there has not been a single week without a social group protesting. The number and frequency of these protests is a sign that the country has run a long way along an undemocratic path, one which the current government has managed in the worst possible way. It has blackmailed and oppressed those who demanded justice, freedom and equality. The demonstrators clearly set out their demands for several months, until it became a question of the democratic character of our institutions. Since particular demands couldn’t be negotiated with the institutions – due to their undemocratic process of deciding on serious issues, such as education reform, judicial reform, freedom of press and tax policy – the separate groups united into a wider front, which now wants to see a serious, substantial change in the way the institutions function. We are demanding civil oversight of the work of security forces and a participative process of decision making for citizens at all institutional levels. As the political crises deepened with the opposition’s revelation of corrupt and criminal government scandals, the dissatisfaction increased. Curiously enough, throughout all of these massive social mobilizations, the opposition has kept itself out of the process. They focused on revealing the tapped materials named ‘the Bomb’. On Tuesday May 5., a major demonstration took place, with instances of violence, that resulted in several arrests and injuries. Something new had emerged. From the ruins of the past failures or remains of success, a new force was putting forward its own dynamics. A new kind of enthusiasm was on the way. 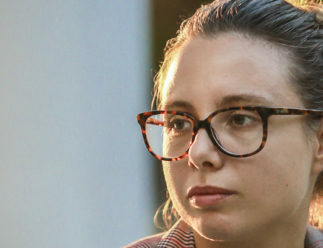 A process of civic mobilization beyond ethnic lines of division – which was tirelessly advocated by civic activism made possible by the student’s movement in 2015 – was now becoming the symbol of unity against a corrupt and criminal government composed of a Macedonian and an Albanian political party. All this in a country where ethnicity has played a major role in the politics of the ethnocentric political parties of the establishment. The three days following May 5. were marked by flows of people taking to the streets, organized through activist organizations and the grassroots social movement. We demanded the resignation of the government! On Saturday May 9., a heavy clash, between an armed group termed ‘Albanian insurgents,’ and the police forces of Macedonia took place in Kumanovo. It officially resulted in 22 deaths, with casualties from both sides. Any interpretation of the tragic events in Kumanovo of May 9. and 10. will inevitably fall into the realm of conspiracy theories, ranging from the involvement of the USA to the intervention of Russia. It will most probably never be known beyond any doubt what happened, and why, on those two days. 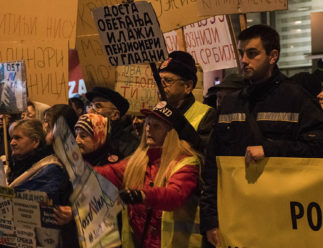 The opposition, which has remained largely inactive throughout Gruevski’s years of authoritative rule, has announced a citizens’ demonstration on May 17. It’s a gamble. Many civic organizations have decided to join the opposition, uniting against the restriction of freedom and democracy. Ultimately, the opposition is a political party that will run in the next – demanded – free and fair elections. Civic society will have to return to its own position, attempting to rebuild its own credibility in the new context. In the meantime, a risky new development has occurred. The opposition party seems to have monopolized the struggle for justice, freedom and equality. It has sought to become an umbrella under which all progressive social forces ought to be united; they believe unification should run under the umbrella that they have termed ‘Citizens for Macedonia.’ Most of the civic activists have suddenly found themselves in a crossfire, or more precisely, a double fire. You fight the current regime, while resisting becoming entangled with the opposition, which has its own faults and past mistakes to answer for. At this point, there are calls for a unification of the struggle. The Government, whose days are numbered, is rearranging its forces, while the opposition is in need of each and every person in the clearly declared struggle; ‘you are either with us, or you are with them’. It is not a vision which promises Macedonia a reconciliatory future. Indeed, it poses a challenge for setting a clear line of demarcation between popular demands for real change and the two parties struggling for political power. It might not be a position supported by the majority of the people for the moment, but it is beyond any doubt a position worth fighting for. Witnessing the unification of the elitist quasi-left and reformist new-right political forces calling for a May 17. rally together, only strengthens the argument that we need to do away with an old mentality of politics and pave the way for real change. But, that could also mean that the threat of Gruevski’s continued regime, is far greater than the current political differences within various opposition groups and parties. Only with the benefit of hindsight, will be know whether temporarily setting aside the democratic value of maintaining political differences, is a smart political move. ABOUT THE AUTHOR Artan Sadiku is a theorist and activist from Skopje with a doctorate in political philosophy. He lectures at the Institute of social sciences and humanities in Skopje, and has written for Macedonian and international journals.